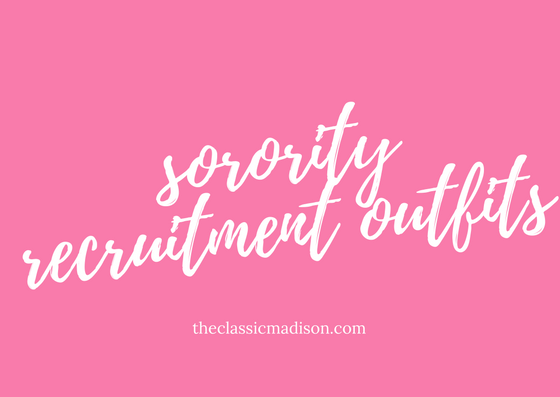 For many of you heading to college, sorority recruitment is approaching. You might be nervous, might be excited, and you might be wondering what you will be wearing. Many schools rush in the "fall" (ie. August where it is incredibly hot!). 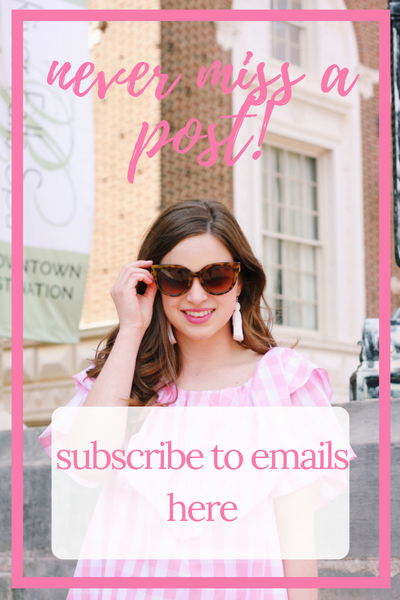 My school, Furman, rushes in the "spring" (ie January), so whenever I was looking for things to wear for rush it was definitely difficult as most bloggers wrote about fall recruitment. Come spring semester, I will post about outfits for spring recruitment, but as the majority of you will be going through fall recruitment, I wanted to get this up here before August starts! For those of you completely unaware of recruitment, I'll break some things down. Recruitment or "rush" is the process of a potential new member (PNM) visiting the sororities "parties" (rounds during recruitment about a specific aspect of the sorority- house, philanthropy, sisterhood, rituals, etc.). Each day, the PNM will drop houses she is not interested in, and a house can drop her if they do not see the PNM as fitting in the sorority. This might seem like a stressful process (and it can be!) but it's also highly accurate in helping you find your home in Greek life. Part of the process of recruitment is representing your best self. 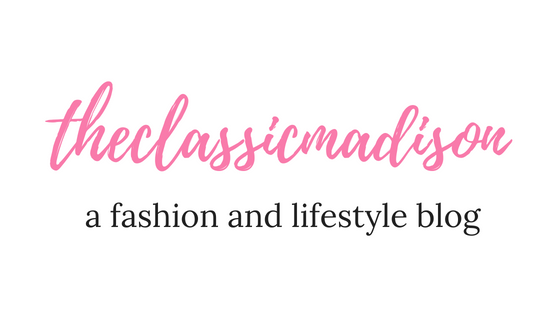 I'm a firm believer that your style is a great representation of who you are (especially your personality!). I made sure to wear outfits during recruitment that reflected my personal style as well as helped me stand out. 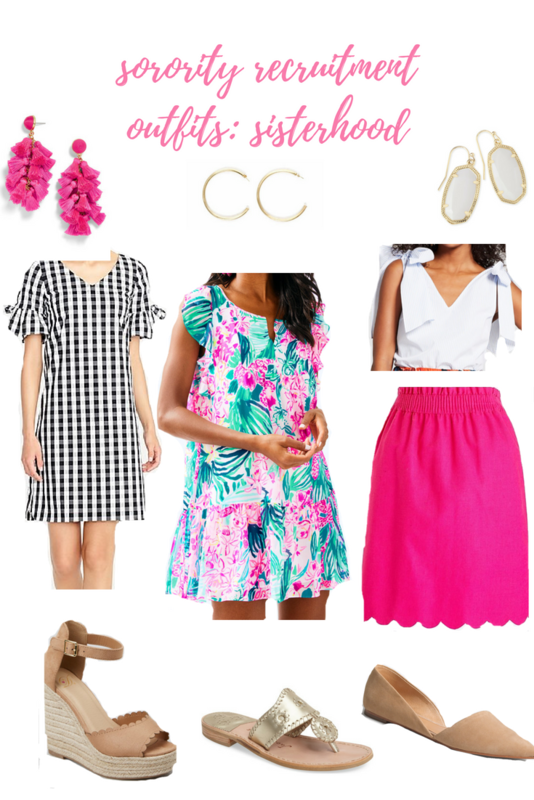 Today I wanted to help y'all find some outfit inspiration for each round of recruitment, as well as learn how to bring your own personal touch to your "required" outfits. Hopefully before you start recruitment, your recruitment counselors (Pi Chi, Rho Gammas, etc.) will walk you through ideas of what you should and shouldn't wear. My Pi Chi's put on a fashion show for everyone rushing and also answered any questions we had about outfits. Each school does rush slightly different (as in by the number of rounds, requirements, etc), so this is how it pertains to my school. Of course there will be overlap with other schools, but just be sure to check your own universities' guidelines. 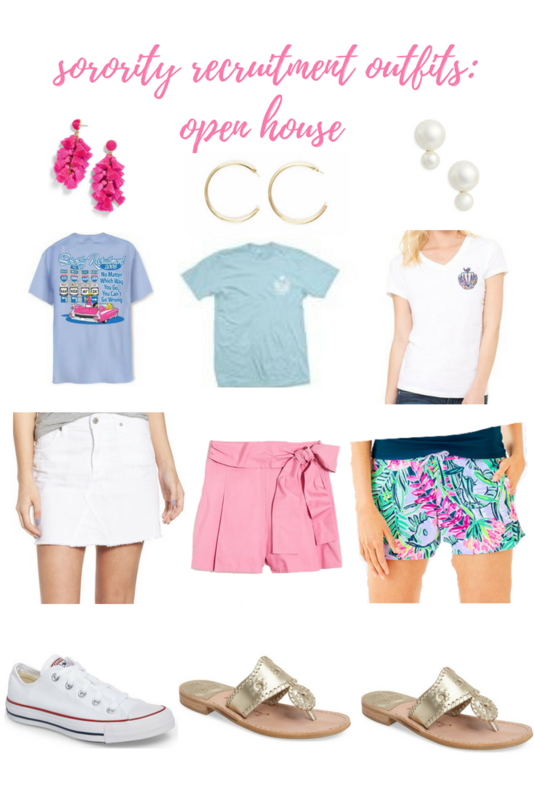 Open House is generally the most casual day of recruitment. At certain schools (such as Furman), Panhellenic will give out shirts to every PNM to wear. In Fall recruitment, a PNM would typically wear the provided shirt, some form of shorts or casual skirt, and comfortable shoes. During this round, I wore the provided shirt, jeans, and converse. Keep things casual but presentable. Philanthropy round is probably going to be a bit more formal than Open House, but still casual. At Furman, Open House and Philanthropy round are combined, so I am honestly not super sure the exact things to wear for this round. I researched a bit for other schools, so I'll include what I found most helpful from those in this post. A nice blouse and jeans or a casual skirt is a great option for this round. 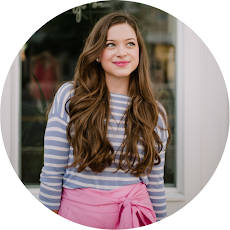 Treat your outfit in this round like you are looking cute for school. Sisterhood Round is a step up from both Open House and Philanthropy round. This is where you will start wearing nicer clothes, ones you would probably wear to church or a casual banquet. Dresses or a nice skirt and nice blouse are recommended. I wore a skirt and sweater during this, which is something I would wear to church. Preference Tea is the most formal day of recruitment. At these rounds, you will want to wear a more formal dress (such as a cocktail dress). At some schools, your recruitment counselors will tell you to steer clear of certain color dresses. Many sororities will wear black or navy dresses during preference tea, so they ask that you wear dresses of any other color but those. If this is the case, just be respectful of the recruitment team's wishes! I hope this guide has helped you figure out a general idea of what to wear during rush. Of course every school is different, so make sure to ask your recruitment counselors what they recommend you wear. Many schools will provide a guide for outfits, so follow that entirely, and then come back here for specific outfits that might match up with your school's guidelines. If you have any questions or need help finding something for rush, please shoot me email! And just a note- don't feel like you need to buy anything for rush. I bought absolutely nothing for rush, as I just used items already in my closet. If a school is doing values-based recruitment (recruiting based on values and character rather than appearance), your outfit will not determine which sorority you will join. 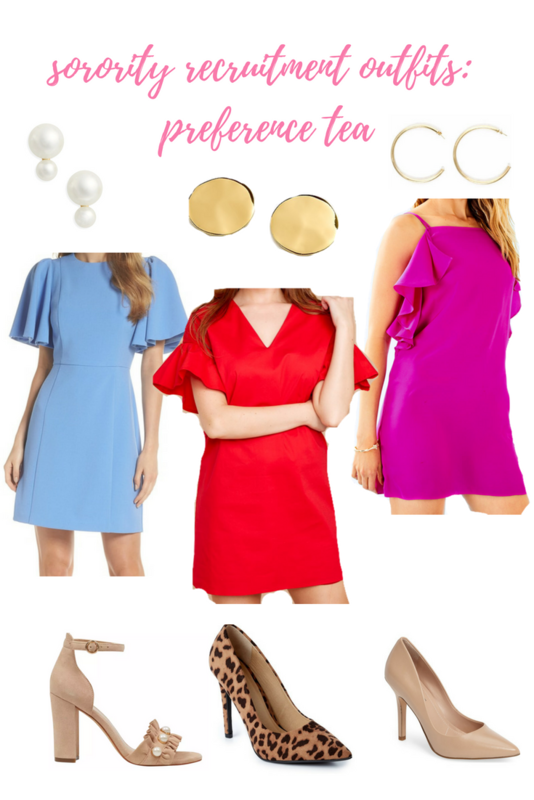 These outfit guidelines are put in place at schools so that you know the level of formality that the sorority members will be wearing, and so that the PNMs outfits are appropriate for those rounds. Just relax about outfits- it won't be as a big deal as you might think! And with that being said, make sure that you are confident in your outfits and that the outfits reflect your own personal style, not those of a sorority you are hoping to join. 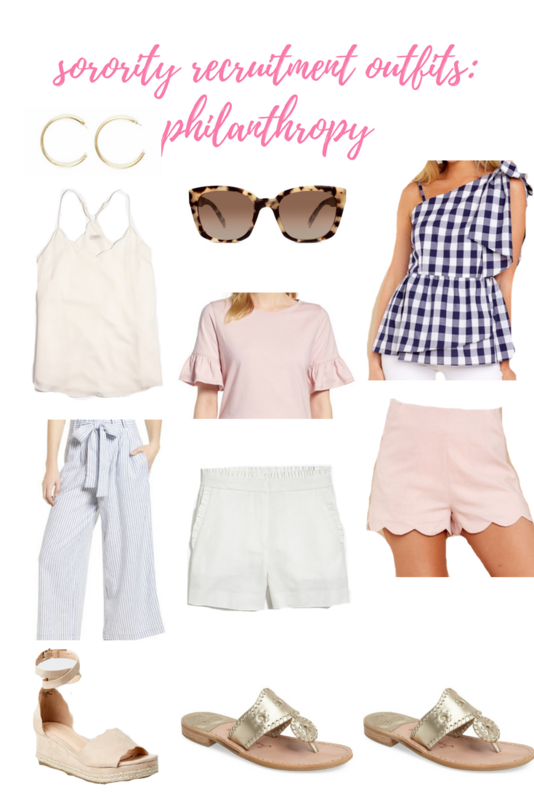 You don't have to dress "preppy" or "insert any other type of style here" because you think all the other PNMs will dress that way or because you think a sorority will like you more. Dress in your own style and be confident in what you are wearing.